Ray & Mike’s Deli has become a regular part of the Quinnipiac experience. Just like hiking at Sleeping Giant State Park or going to a men’s ice hockey game, Quinnipiac students usually find themselves eating a sandwich from Ray & Mike’s Deli at some point during their college career. But many people do not seem to know the man behind the curtain… one of the founders: Ray George. George, 50, is originally from Trumbull, Connecticut. He has been living in Connecticut for a great deal of his life. George said that he was brought up with the mentality that you are supposed to work well. His father’s emphasis on a good work ethic seems to have affected George greatly. The deli is known for its quick service. It is also the only local deli that is open every day of the year, even during holidays and in snowstorms, according to its website. George himself is definitely a hard worker. During a portion of his interview with the Chronicle, he was still ringing customers out at the cash register. Hamden resident Haley Wright, 32, has known George for 17 years. Wright works alongside George at Ray & Mike’s and said that he is very dedicated to the deli, since he works 11 hours on average each day. Wright has seen a different side of George while working with him. Ray & Mike’s Deli started after they sold a family business (similar to Ray and Mike’s Deli) in Milford, Connecticut. They first got the place in the ‘80s. 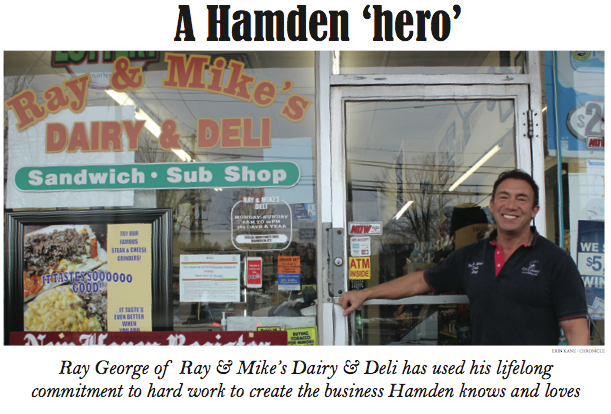 After the family sold the place in Milford, George and his brother, Mike, decided to come towards Hamden because it was a growing area in Southeastern Connecticut. Some of these changes include adding a menu and more of a deli counter to the back and focusing on more single serve items, both hot and cold. It was both of the brothers’ ideas to start the deli. George called it a joint effort, and both of the men were happy to get into the business. This dedication highlights why customers are drawn to the deli’s speciality sandwiches, such as: The Irresistible, Chipotle Philly Chicken, Quickwich, Mac Daddy, Cluckin’ Russian, Blue Dream, and “Buffalo Style” Philly Chicken. Over the years, staff and customers made up the names of the sandwiches. Employees, customers and George also thought up the recipes. George’s favorite sandwich is the Steak & Cheese because it is one of the elements that drastically increased the deli’s popularity. Owning a well-known business can have a downside, though. It means putting more work hours into the deli. Currently, George says he does not have a lot of free time because he is working every day. However, he does like keeping in shape. Surprisingly, George’s favorite memory is not work or fitness-related. He said that he enjoys the times that he has vacationed in the South. As for George’s feelings about being close to Quinnipiac’s York Hill campus and Mount Carmel campus? “It’s great, it’s an extra customer base from when the semester starts to when the semester ends,” George said. When the semester ends, landscapers and construction people often stop by the deli. Currently, George is a lone wolf. A great deal of his family lives in Florida. He says he is single with a “bunch of ex-girlfriends.” However, George is happy nonetheless. This enjoyment of work seems to stem from seeing people happy at the deli. The best part of the job is seeing people be happy, according to George. It is also a good experience to see people come back years later.